After he studied law, Bernard Magnan entered the army as a volunteer in 1809. He fought in Spain and in 1814 he took part in the campaign in France and Belgium. His career advanced and in 1830 he fought in Algeria. He lost his position in 1831 after he had reacted too weakly against an uprising in Lyon. During the same year he joined the Belgian army as a general. In 1838 he returned to France. It was thought he had supported Louis Napoleon Bonaparte when the latter tried to seize power in 1840, but he was cleared of suspicion and in 1845 he became a division general. In 1851 he was the commanders of the troops in Paris and he savagely suppressed the uprising that followed the coup d'état of December. In reward he became a senator in 1852 and Louis Napoleon awarded him the title of Maréchal de France in 1853. 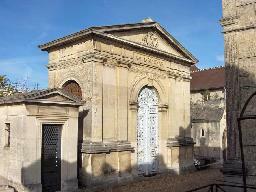 The mausoleum of Bernard Pierre Magnan at the Vieux Cimetière, Saint-Germain-en-Laye.